Hate it. Hate it. Hate it. "Please don't buy me anything this year. From now on, I'm only exchanging presents with relatives." Wonder if it will work. Cow exasperated enough to give it a try. A friend has another idea - everyone buy something for themselves. Everybody is happy and only has to buy one thing. It is easier and cheaper, too. Ha! Cow knew she could count on her most excellent and imaginative readers for really good ideas! Excellent idea! I could also try on my relatives the following: "Please don't buy me anything this year. I will only be exchanging presents with friends..."
Well last year my aunt said that since Christmas is Jesus' birthday, buy him a present(do something for a charity)-you can buy me something for my birthday. I can not tell you how it freed me! We only do Santa Claus presents for the kiddo. My kid gets way too much crap from the relatives as it is, so I keep paring Santa down too. We are trying to do more for charity this year. 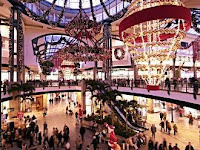 I hate shopping, I hate the commercialism of Christmas, I hate the mania that happens to people when they get in stores. It's just all become too much. BTW-How is your work situation going? Everyone should give each other photos of themselves, in a variety of poses and costumes (or states of undress in some cases). Hee! Cow is glad to know it's not just a Cow thing (exasperated). Susan: This is a good idea. Cow would get a lot more out of lunch than most of these presents. Heather: Agreed. If we all just helped out charities, it could be a better world instead of an in-debt world. Work is okay. Cow is now locking her file drawers against the snoop. Gorilla: Cow is awaiting your photo! Or photos! Supermom: Yes, The Land of Topiary ideas are always primo. It's a vicious cycle. You buy a friend a gift (or they buy you one) and then there's the obligatory reciprocity, which grows a bit each time. If you start gradually cutting back, or just giving something homemade or simple (like the ornaments)then it can ease the burden on both sides. I bet some of those people would be glad to be set free of the need to buy things too! And it's not as if, when somebody shows up on your doorstep, that you can just say: WAIT! I don't DO presents! Take it back! Susan's idea of easing out of it is a good idea. There's a great $3 mix for lemon bars which is easy, tastes good, and is very affordable...and can be decorated with tasteful greenery!